In this third part based on Nouman Ali Khan's 'Revive Your heart', he talks about the leadership of Prophet Muhammad, peace and blessings be upon him. Specifically the incident relating to the Battle of Uhud and how he responded to the archers that were supposed to maintain their position on the mountain. This example gives great insight into how we should treat those who are under our charges when they've made a mistake. It applies to all types of leaders, including parents. The archers in the Battle of Uhud made a mistake of leaving their post which lead to a huge loss for the Muslims. Imagine how they felt when the battle was over. This is the same when your child makes a mistake and realised what he's done. He will feel regret, anxious and terrified. If he is treated harshly every time he makes a mistake then his self-esteem will plummet. He can build resentment and even hatred for your lack of understanding and unkindness. So when your child makes a mistake you have to be extra kind and lenient. How was Prophet Muhammad, peace and blessings be upon him, kind and lenient to the archers? He spoke softly to them, made dua and still asked them for their opinions on certain matters. He listened to them, focused on what's good about them and forgave them. As for children, when they are young we should teach to listen to us even if they don't agree or they have a different opinion. This is easier said than done but if we can respect their opinions and let our children express them then at the end of the day we can say to them, "I understand that you have an opinion on this matter but as a leader of this household I believe we will do it this way". This will not only give acknowledgement to their opinions but also teaches them to follow the leader. 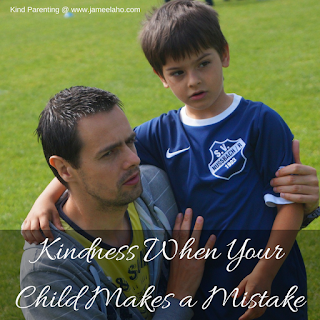 If we could always remember to be kind in all our interactions with our children (or any other relationships) then our relationship would be more smooth and fulfilling. Like this? Then you might want to get the book below (my affiliate link).